Along with falling leaves, swapping light blouses and sweaters for cozy jackets, giving up Sunday car trips for football games, changing curtain sheers on the windows from white to gold, making the dishes in the hutch go from summer white to the brown and white of Johnsons' Friendly Village, fall is a perfect time to think about apples. How could you have a Halloween Party without "bobbing for apples"? How many times have you said, "Trick or Treat!" and gotten a caramel apple wrapped comfortably in a paper wrapper? Who doesn't love walking into a home the night before Thanksgiving only to be greeted by the smell of a baking apple pie wafting through the air? Somehow, apple spice doughnuts at a Fall Party would not be the same without some warm apple cider ladled out of a punch bowl garnished with a cinnamon stick. 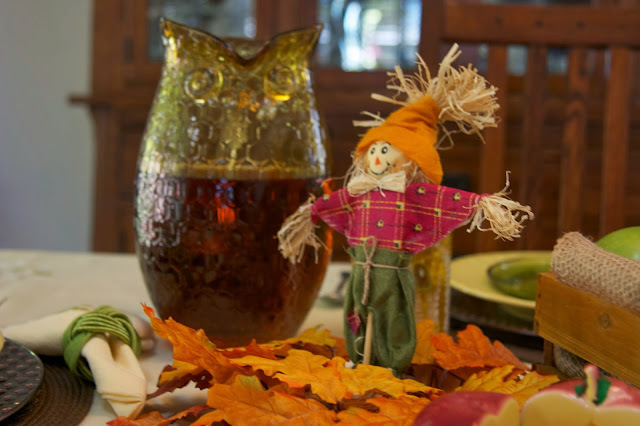 So, producing a fall tablescape that celebrates the apple is totally understandable. Let the fun begin!! 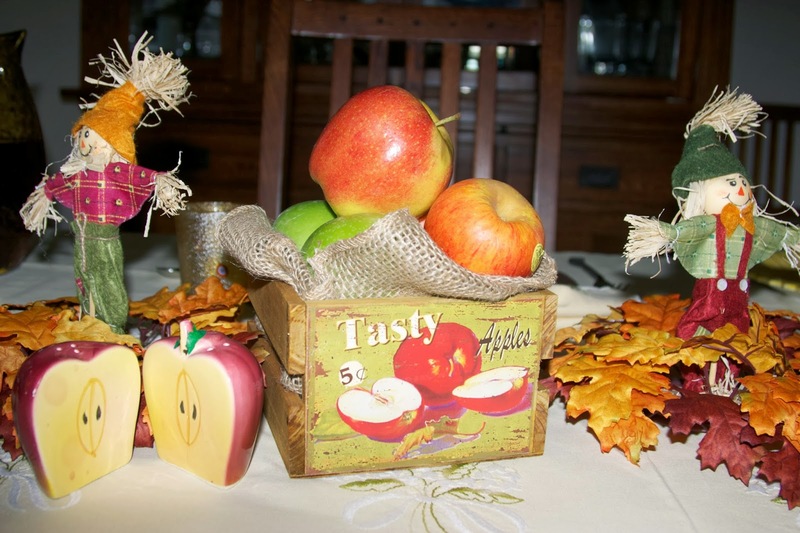 Here's my tablescape celebrating the apples in fall. I started with a yellow tablecloth and napkins that were a gift from my in-laws when they traveled to the island of Madeira near the Azores. Since these wonderful people are now gone, using this tablecloth in this tablescape, made the project even more memorable. 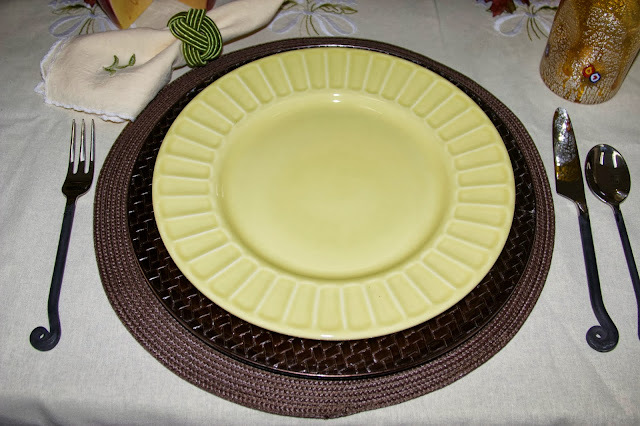 I then layered with a brown basketweave charger from Michael's (now on sale!). I had seen these last year, talked myself out of them eventhough they go well with my Thanksgiving Johnson Bros. plates; thought about them all year, then was happy to see them back in stock THIS year, so I grabbed them. Has that ever happened to you? Next, came a yellow dinner plate from Home Goods. It is labeled Matceramica on the bottom and it is made in Portugal. I topped the stack with a green apple-shaped plate found at a swapmeet. It was a steal, and I feel it works well for the theme of this tablescape. The setting is surrounded by flatware from World Market (it is a "Treble Clef" pattern, but I think it reminds me of an apple stem.....kinda!) The napkin ring was on sale at Bed, Bath and Beyond and it is my FAVORITE color. 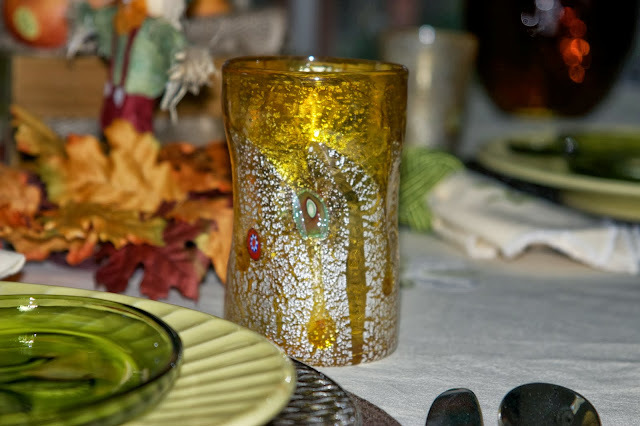 The glasses were purchased in Venice at the Murano Glass Factory when we went to Europe a few years ago. ( Doesn't that sound impressive? We went on one of those "If it's Thursday, it must be Belgium" 10-day rapid tours, but it was wonderful!) I love, love, love their color and shape (can you see the indentations in the glass and inset colored glass fragments?). I created the centerpiece using a wooden crate I found at Michael's. I filled it with apples, and tried my hand at wrapping them with burlap ribbon that seems so popular in today's fall decorating trends. I hope to find more uses for it around the house as I continue with my fall decorating, for I do like the look. Next to the apple crate are free-standing scarecrows I found at Target (look in the "dollar" section!) and then the fall leaf candle rings were from Hobby Lobby. I also scoured my salt and pepper collection again, and came up with the split apple s + p shaker! 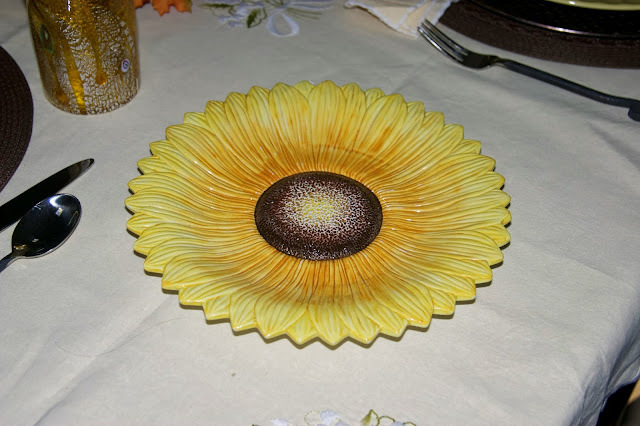 I added the sunflower plate (found while antiquing and marked only "Italy" on the bottom). I thought it would work well for holding apple spice muffins for a fall brunch. I just bought this owl pitcher at a Design Center. I figured my grandkids would love the shape! Care for some apple cider? One last look at my entry for "The Apple Challenge". Thanks, Kathleen at Cuisine Kathleen, for hosting this tablescaping challenge, and giving us all a chance to get our creative juices flowing. And thanks, Susan at Between Naps on the Porch, for hosting "Tablescape Thursday"each week which allows us to connect with other fellow tablescapers!! I'll be linking up to Between Naps on the Porch, and Cuisine Kathleen this week. Thank you for visiting my blog. It would be great to get a comment from you. If you have to sign in as "Anonymous", please sign your name in the comment box so I can respond to you personally. Thank you, Kathleen, for taking the time to comment! 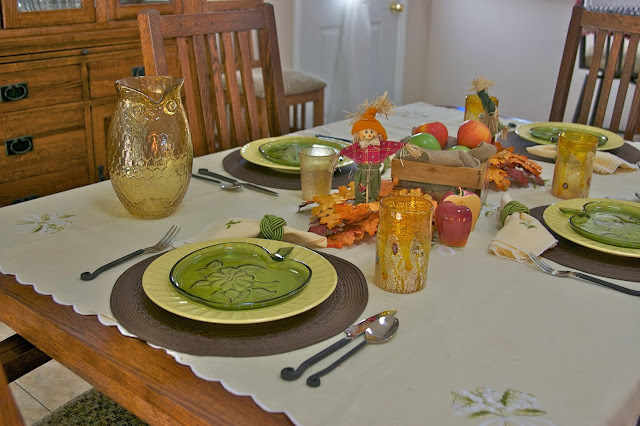 I follow your blog regularly and LOVE your colorful tablescapes and creative ideas. I'm hoping to join Let's Dish as often as I can. Thanks for hosting such a fun event! Love the scarecrows with the apple theme Rosie! Cute! Thanks for stopping by, Jenna. I appreciate your support since I'm so new to the blogging world. All positive comments are greatly appreciated! Such a lovely table and welcome to blogging! 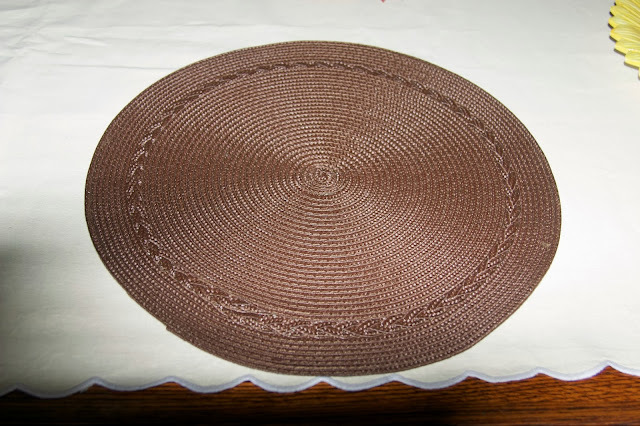 I'm a vintage tablecloth collector and am also into tablescapes. Visiting from Let's Dish. Rosie, what a lovely table...those apple plates are great. I see you are another green lover...my favorite color, too! Cute pitcher. Thank you for stopping by and taking the time to comment. Yes, I absolutely love green, and find my eyes drawn to plates with any shade of it!! Take care. Great job on an apple-themed table! 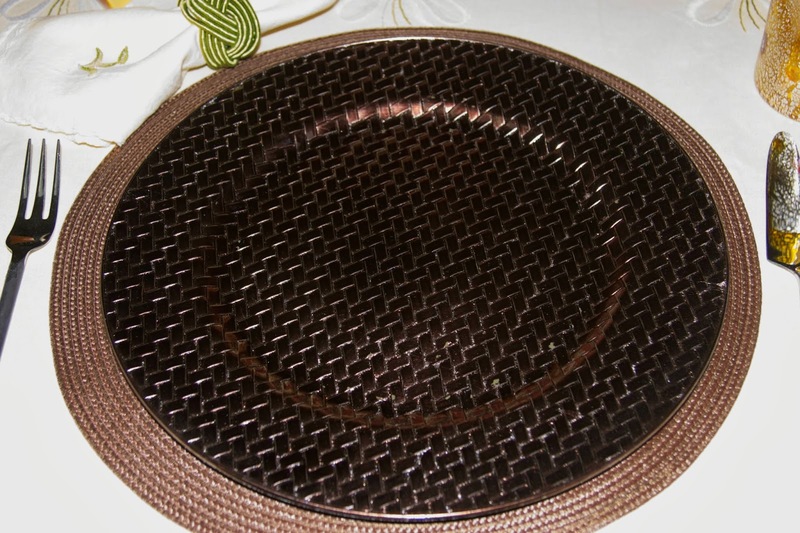 And thanks for the tip about those fabulous basketweave chargers. I may have to run by Michael's on the way home from work today! I love those green apple-shaped plates, too. You have some nice collected items- love the murano glasses and the tablecloth. The scarecrows are cute with the leaves- as if they were standing in a field covered with leaves. Love the green glass apple plates and the owl! So many cute Fall and apple details. Your apple table turned out lovely! So wonderful...love those apple plates. Thank you for your thoughts, Bev. I follow your blog all the time and it means a great deal to hear from you. Have a good week! 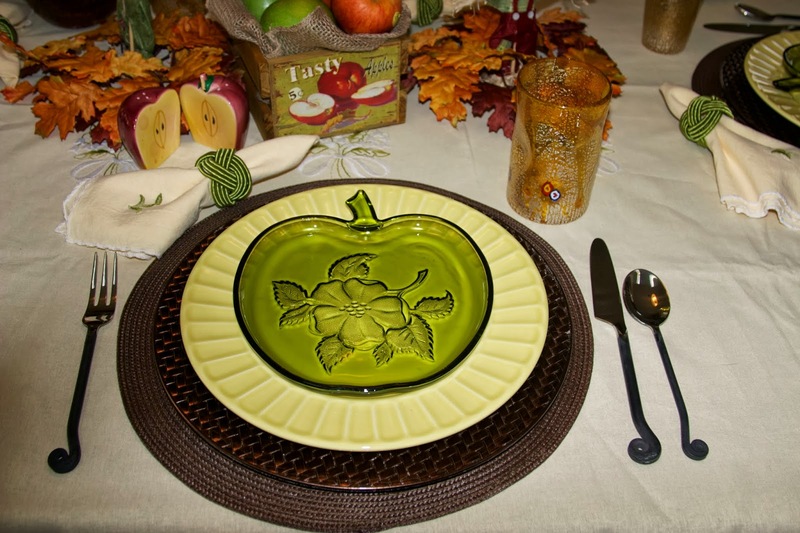 Those green apple plates are wonderful! The apple crate is a lovely centerpiece.